Great Falls - Skip Bobbett passed away May 5, 2015 at the age of 96. 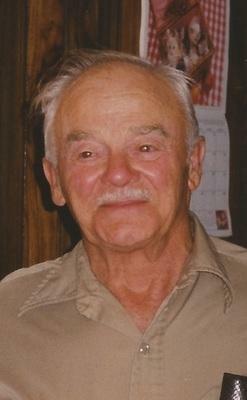 He was born in Great Falls, in November 1918, to Andrew and Martha Bobbett. He lived his life on the west side of Great Falls and had many adventures to tell about from growing up in early Great Falls. He married Madelaine Lindblom in 1939 and they shared 59 years together until her passing. Skip and Madelaine enjoyed dancing at the Harmony Club in their younger years and playing cards with friends on Saturday night. Skip was an electrician by trade for 47 years at the Anaconda Company. When he wasn't at work his passion was working on building projects. He was a DIY, "do it yourself" man before it was popular. As a very young man he built their first house. As the family grew, he built a larger house along the Sun River he knew so well. Always having loved the river, he built a boat starting with an old Chevy engine. The family has many memories of summers spent skiing on the river with dad driving that boat. Skip was a loving role model to his children and grandchildren. He was a partner in crime for mischievous games and could be seen snickering and chuckling with the kids. He had a keen ability to stay current with the times, growing and adapting to new technologies. Skip spent hours on the computer reading and researching as well as Skyping with his family. He was preceded in death by his wife, Madelaine; brothers, Andrew and James Bobbett; and twin sisters, Evelyn Maitland and LaVerne Garrettson. Surviving Skip are his daughters Bette (Ben) Ellingson, Sherry (Garry) Mott, Leona (Dave) Olsen and Colette Barnes; 11 grandchildren; 14 great grandchildren; and two great-great grandchildren. A Funeral Service will be held at Croxford Funeral Home, Saturday, May 9, 2015, at 2:00 p.m. with burial to follow at Manchester Cemetery. In lieu of flowers, please make a donation in Skip's name to a charity of your choice.